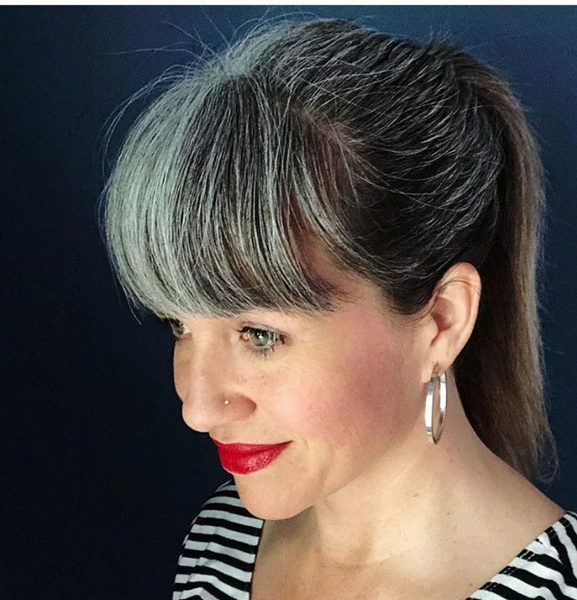 I started a #silverhairredlips challenge on Instagram recently because I find the color combination of gray hair and red lipstick to be a winning combination. 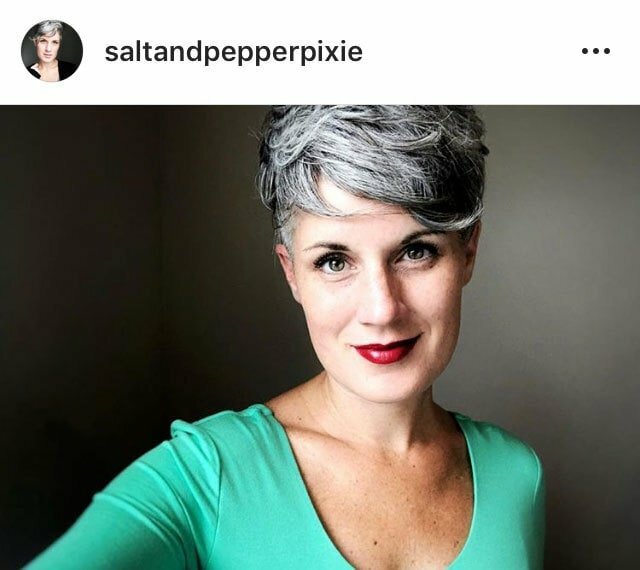 Occasionally, I get called out by fellow silver sisters who feel that wearing lipstick is counter to embracing one’s authentic self. Well, my authentic self likes makeup and hair products, and all sorts of unnatural things. And when I get questioned about my choices, it bums me out. Why? Because I’m a tired woman. I’m tired of people making assumptions. When you’re a woman, other women are often your worst critics. It feels like we’re always being judged. Judged for skirts being too short or too long. Judged for being too modest or not modest enough. Judged for dyeing your hair or not dyeing your hair. Judged for being too thin or too fat. Judged for getting married or NOT getting married. Judged for taking your husband’s last name or NOT taking his last name. Judged for not having kids or for having too many kids. To me, being a feminist means making the right choices for ME. And the right choice for me might not line up with YOUR values. And sometimes the right choice for ME might not even line up with my OWN values! Human beings are not perfect. What fun would it be living in a rigid world where everybody got into lockstep with everyone else? I don’t want to live in that world! I like complex people, not automatons. I’m a lipstick fanatic. I mean, I love ME in lipstick and I love other ladies and their lipstick, too. (I also love ladies who don’t wear lipstick, but this part of the post is about lipstick, so please bear with me ❤️). My lipstick love affair started when I was a young girl. I remember getting kisses from grandparents, aunts, and church ladies and ending up with red or coral or pink lip prints on my cheek. I remember it like it was yesterday, getting hugged and kissed by those dear ladies – I can still smell their perfume and their face powder. Those signals of femininity are meaningful to me – I associate those scents and colors with love. When I was in junior high, my Mom bought me my first makeup and it was love at first sight! The pleasure of being able to alter your appearance just for fun! Sheer heaven. I felt sorry for boys that they were denied this pleasure (although it was the 80s, so I guess Adam Ant, Duran Duran, etc. were using it – but not the boys in MY Michigan high school). In college, I experimented with all sorts of fun lipstick colors. One day, I was about to walk into my photography class, but I stopped outside the door to fumble for something in my bag. Just as I was about to walk in, I heard my name mentioned, so I stopped to listen. I was mortified, but I have to admit that it was a fairly accurate description of me at the time! 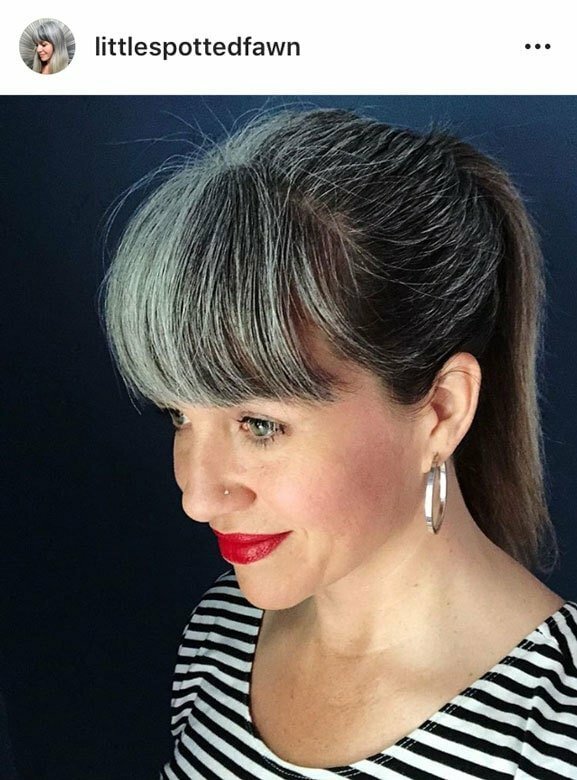 When I had my babies, I stopped wearing lipstick because I wanted to be able to kiss those sweet faces without leaving red or burgundy lip prints all over them. 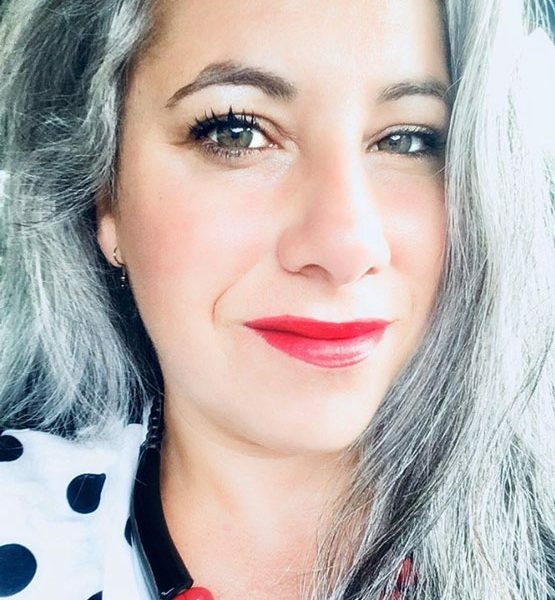 My kids are teenagers now, and won’t allow me to smother them with kisses anymore, so I started going back to lipstick. I’ve also gotten older, and what little natural color I had in my face is gone. The past few years have been difficult. We’ve had to battles serious illnesses, financial difficulties, wildfires, and the relentless, depressing news cycle. If wearing lipstick makes me feel better, for whatever reason (even if it’s terribly superficial), I’m going for it! Let’s all give each other that courtesy, online and off. And if someone gets on your case for anything, check out this post. My blog is a no-judgment zone. If you decide you want to go back to coloring your hair, go for it! 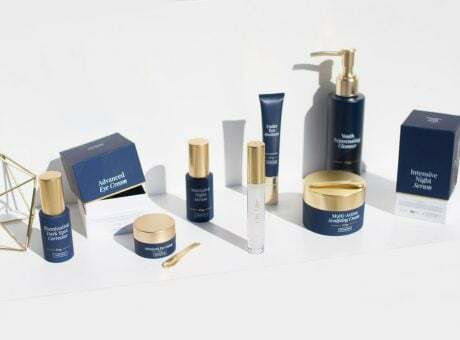 Do you hate makeup? That’s your right and more power to you! Stick to what works for you and I’ll do the same. I pinky promise! And in the spirit of that promise, please check out the Silver Revolution Facebook group. 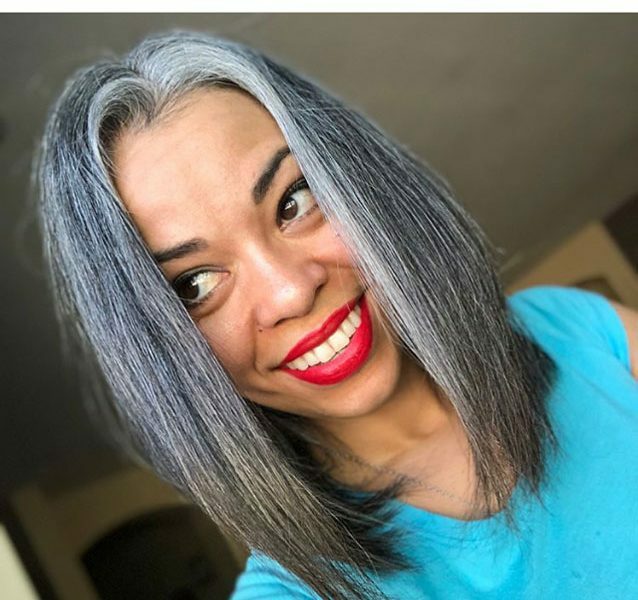 It’s a gray hair support group for women like us, and it is a no-judgment zone. There is only one rule on that group (unlike many of the more restrictive groups) and that rule is BE KIND. I hope to see you there! And P.S., if you do like lipstick 😉, check out my favorite: Red Velvet by City Beauty. Hallelujah! Red lipstick lovers! Thank you for your kind, and refreshing thoughts. 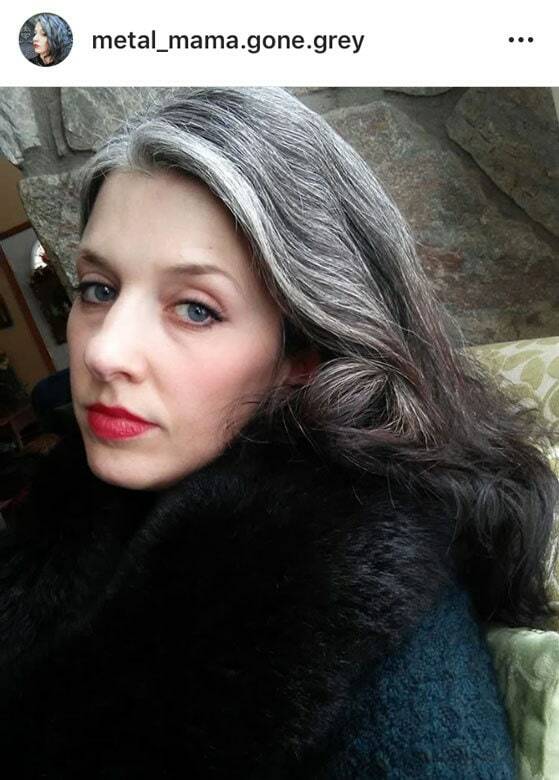 I wanted to embrace my gray about 5 years ago, but as you said, felt judged by others about my choice, caved, and started coloring again. Now I wish I hadn’t. But, here’s to learning to hear yourself. 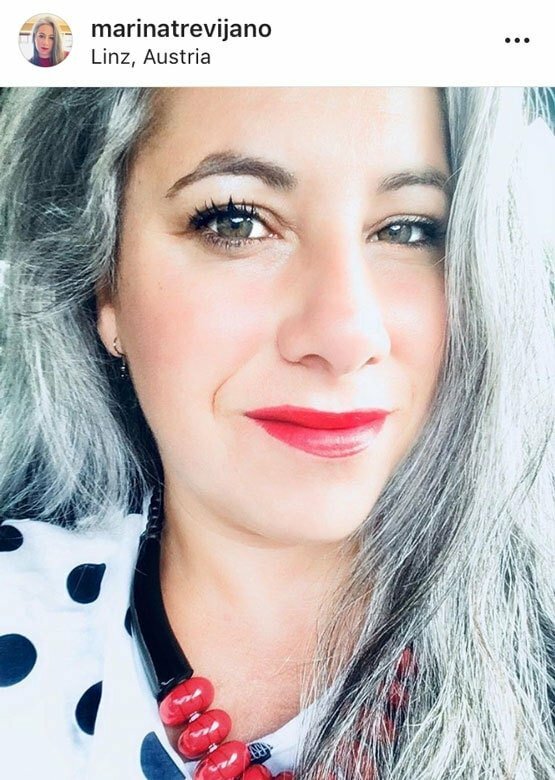 Back to graying transition and that RED lip stick!!!!! Woo hoo! 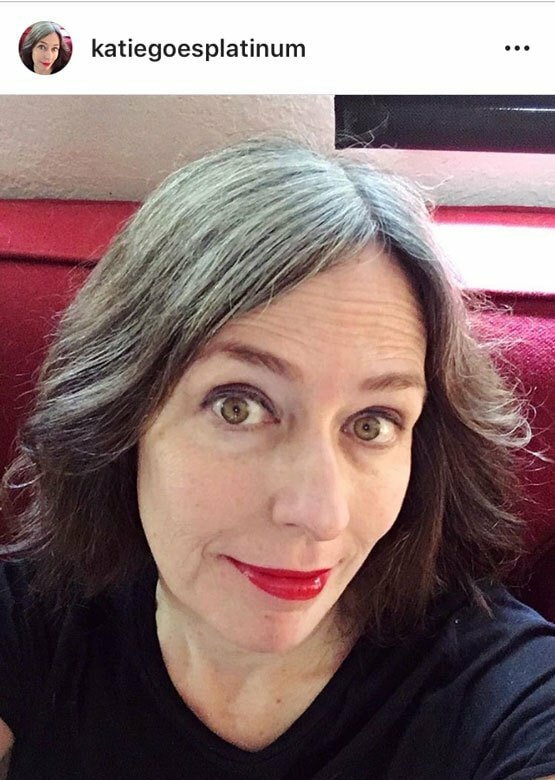 I remember when you and I were the only women in grad school who opted for serious lipstick, and I’m glad that, like me, you are still proud to wear it. 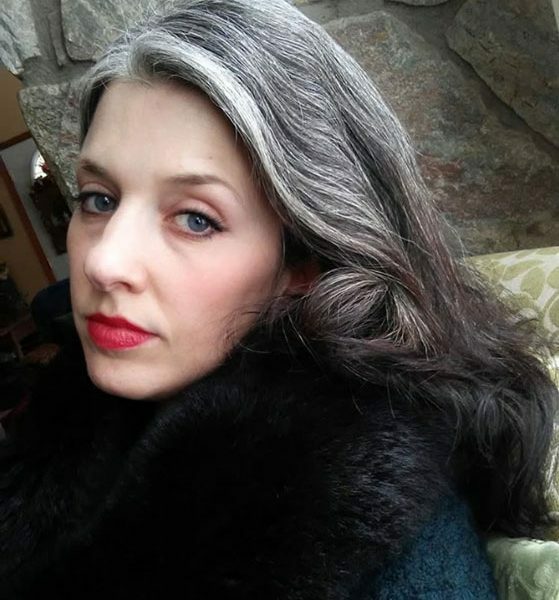 I opted not to ever color my hair, so I am seriously gray now, but people constantly compliment both my hair and my lipstick. Customers who don’t know my name describe me to others as the one with gray hair and red lips! Ooh, I’ll have to look into those Caron! Thanks! 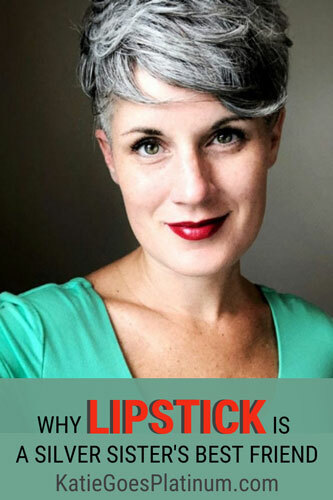 I love the look of grey hair and red lips…’I have rosacea so I have a lot of red in my face…. Is there a nice sheer red that might work for this coloring? Just wondering if you (ok me) can wear red lipstick with freckles! I’ve never, ever thought of wearing red! Oh Katie what a great post!!!!! Thanks for your honesty, openness and realness!!!!! And oh my goodness, THANK YOU A MILLION for all of the awesome red lipstick choices. I am having so much fun learning about wearing makeup again now that I have decided to let my hair go natural and I love the difference it makes in how I feel and look. Sometimes I forget I’m 53 because following all of these wonderful women on their amazing journey makes me feel like we are all just teenagers again figuring it all out for the first time. Fun, FUn, FUN!!!!!!!!! Hi, Debbie: Sorry for the delay – a lot of my comments got stuck in the spam folder! Argh! Anyway, I’m so glad you liked the post! And I’m glad you liked the red lipsticks! I agree with you – it’s like being really young again, trying to figure everything out. It’s fun and exciting! 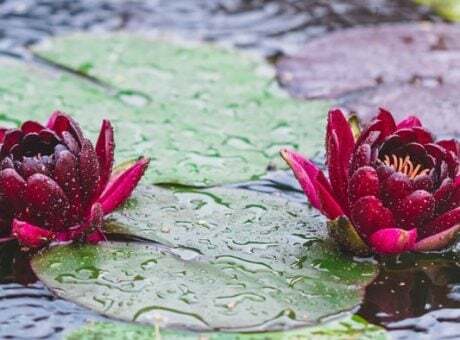 Superficiality should be included in our list of Basic Survival Needs! I deeply mean that! I agree! Otherwise, life would be one big slog! We need some fun to get through all this. 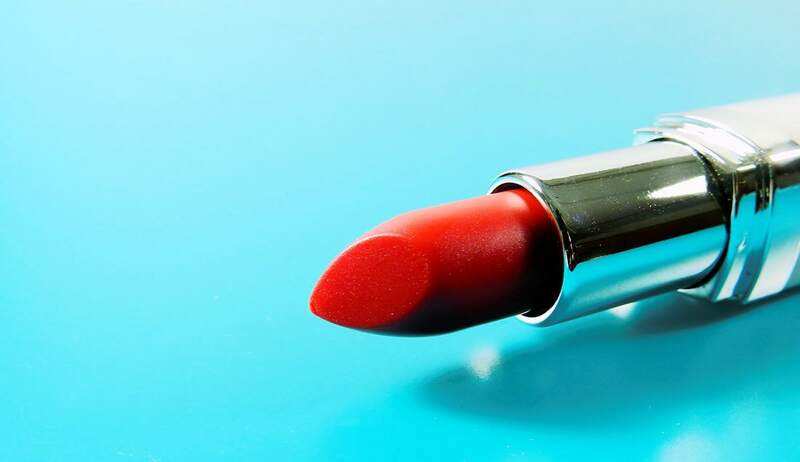 A funny story about red lipstick: about eight years ago, I went into Sephora looking for a red lipstick. When I told the sales associate what I wanted, she said, “No, you can’t wear red lipstick. You’re too conservative.” I was flabbergasted. I think my response was something along the of, “I am NOT conservative…I have a tattoo!” but she continued to insist and then talked me into a nice plum shade that I bought and later returned. I already owned 10 shades of rose or plum. I wanted RED. But it stuck with me until this last year, when I finally went to the drugstore and bought myself a red lipstick that I wore all winter. It still shocks me now, telling the story! Wow, I’m shocked too! What on Earth was she thinking? I’m glad you got your red lipstick after all. Growing out my dye is part of embracing my BEST self, and that’s different for everyone. I realized the other day that it has been literally YEARS since I really looked at myself in the mirror. I think it’s because I didn’t like what I saw. I didn’t like my hair color (no matter what I did to it), I was stuck in a rut in my makeup, my skin looked tired. I just felt blah. Growing out my dye is giving me permission to look at myself again (with, like, a bajillion selfies) and reinvent myself in a new way. I love that! 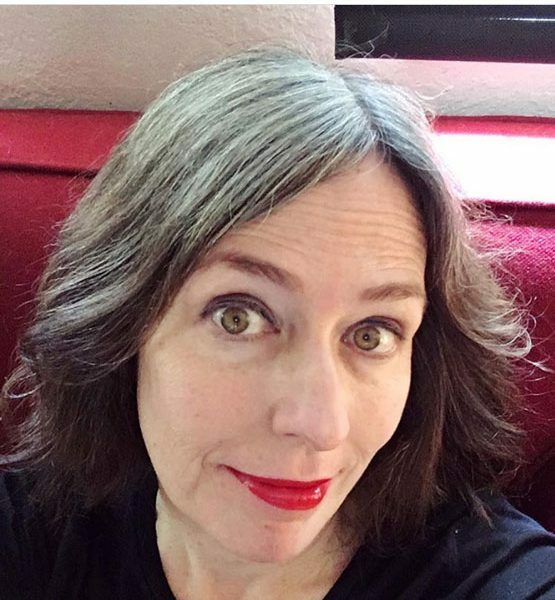 And yes, that reinvention includes red lipstick. By the way, along the lines of women not supporting other women, I actually had a dream the other night where an airline attendant with bright red dyed hair told me I would be prettier if I dyed my hair and did something about my wattle (WTF? I don’t know why that came out of my subconscious). Anyway, I told her she would be prettier if she was a nicer person. Score one for my dream self! Amber, I love your dream! And I agree with you about reinventing ourselves. 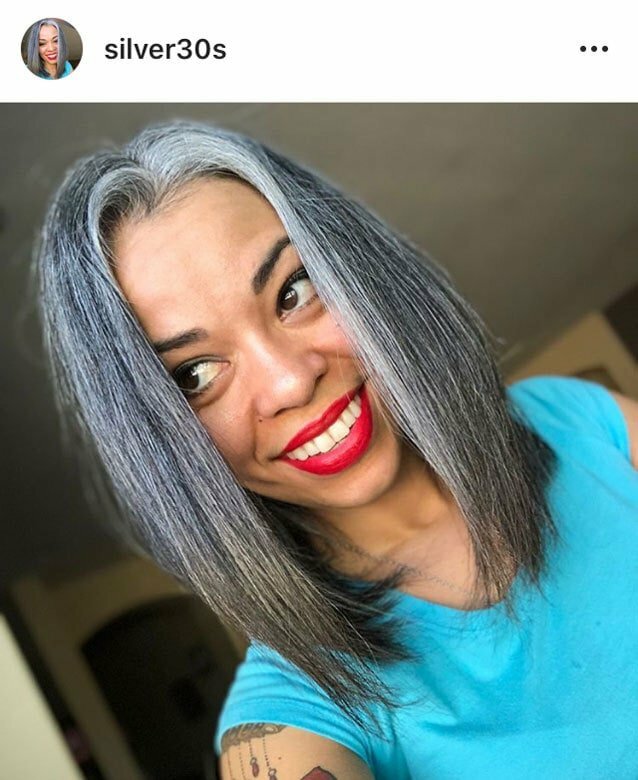 That’s what I like about this gray hair transition – after years of being caught up in my other roles (mother, daughter, wife, etc,) I’m focusing a bit more on who I am again – who am I becoming? What do I want/need? It’s fun!